My family loves to eat squids and my usual lazy way of cooking squids is to stir fry them with store bought sambal belachan. Today, I'm cooking all dishes from scratch, no cheat eats. Sotong Masak Hitam (Squids cook in black ink)is a Malay dish, a lovely dish best eaten with sambal belachan and rice. Squid ink is usually associated with Italian food like pasta and risotto. Many people are quite turn off by the color but trust me, it really tastes better than it looks. To cook this dish, you do not need to buy squid ink from specialty store. You just need to wash and carefully remove the ink sacs from the detached heads. This dish has a simple rempah which doesn't need to fry long, and we all know that squids cook easily, so don't overcook it. Pound,blend or grind all the rempah ingredients into a coarse paste and set aside for later use. To a heated wok, add cooking oil and stir-fry rempah paste, bruised lemongrass halves, sliced onions over medium-high heat until fragrant and the rempah begins to glisten as the oil separates. Strain the tamarind water into the wok and together, add squid ink,half of the sliced red and green chillies. Bring the mixture to a boil before lowering flame to medium-low to simmer.Heat and stir periodically until the sauce thickens when some of the water evaporates. When the sauce reaches the desired consistency,bring up the flame to medium-high again and add processed squid pieces. Stir fry and toss the squid for 30 seconds or so and turn off the flame. Let the squid steep in the residual heat for another 2 min or so before plating. Garnishing with remaining sliced red and green chillies. Serve with steamed rice or nasik lemak. Note: If it is served with nasik lemak,it is preferred for the sauce tobe thicker and more concentrated so that it adheres to the sotong slices better. With plain steamed rice,the sauce is kept slightly more fluid for it to be drizzled over and enjoyed with the rice. This dish complements the Kari Ayam which I also cook from scratch. A plain stir fry French beans with prawns is also served as part of the meal. All photos taken from Iphone. This book presents a study of 13 biblical characters, how they started, how they finished and lessons on how we can close each chapter of life, finishing well. 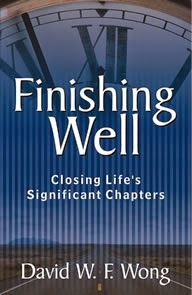 The important part of our lives as Christians is not on how well we start but on how we finish it and finish it well. Well, I would like to some stir-fry french beans with prawns ... as I don’t take squids. I have never tried squid, I am sort of squeamish about them. The photos and presentations are lovely.